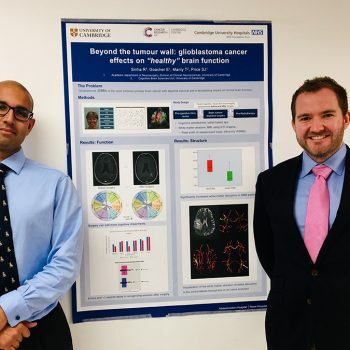 Dr Rohit Sinha and Dr Ed Goacher’s poster was one of 17 research posters on display at the popular ‘Brainworks’ Open Evening, showcasing the latest local research in dementia, mental health and neuroscience, that took place in November. 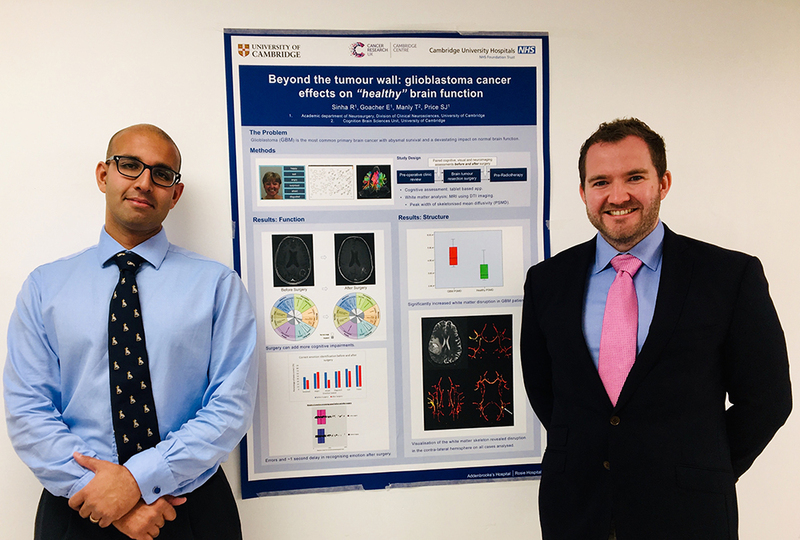 Dr Sinha, based in the Department of Neurosurgery at the University of Cambridge, said: “Our research is about understanding how glioblastoma (GBM) and its treatments can affect the way patients think, and we wanted the poster to convey this. “GBM is a rare but eventually fatal cancer that can have a devastating impact on normal brain function. In fact patients often first notice problems with their thinking – including memory, decision-making and language – before they are diagnosed with a brain scan. Dr Sinha and his team involved patients from the very start of their research planning. This helped to secure the required funding and led to changes in the study protocol to make assessment-test visits less stressful for patients. As a result, the study has a very high recruitment rate, with patients continuing to take part in the cognitive tests as they undergo surgery and radiotherapy. The GBM research carried out by Dr Sinha and his team means that clinicians can better predict which patients are most likely to face problems in their day-to-day functioning, and try to provide rehabilitation to protect these vital functions. The team, led by Principal Investigator and Academic Consultant Neurosurgeon Mr Stephen Price, has applied for an NIHR Research for Patient Benefit Award to build on this work by trialling a rehabilitation tool to help patients with GBM with social and emotion related decision-making, an area highlighted in the data collected by Dr Sinha. Dr Amanda Stranks, Patient and Public Involvement in Research Lead at Cambridge BRC, said: “We were overwhelmed with the positive response shown to the poster competition by researchers. This poster was a worthy winner, clearly outlining their research and the benefit it has for patients in a publicly accessible way. Dr Sinha’s advice on involving patients for other researchers? “Just do it! And as early as possible. There are lots of excellent organisations who can help, including the NIHR Research Design Service and the PPI team at Cambridge BRC, who can put you in touch with patient panels and focus groups.